Get thee to the Chi Lin Nunnery! In the end, this wound up being a blessing in disguise. By the time we left Japan, one thing we knew for certain was that as full as our days had been there, we really didn’t enjoy adhering to a strict schedule. While our initial idea had been that having everything figured out in advance would make things less stressful once we were on the road as it would free up our time to see and do things rather than research and plan, we found it actually did the opposite. A premade itinerary failed to take into account our feelings right then and there, and made us feel guilty if something didn’t go as we had anticipated. We found ourselves craving a little spontaneity and the ability to just let our whims and intuitions guide us, letting a country reveal itself to us on its own terms, rather than our preconceived notions of what would be worth doing before we had even set foot on its soil. We arrived in Hong Kong excited but pretty much clueless of things to do. Sure we had some obvious “greatest hits” we meant to see, but we also found ourselves embracing the possibility of the discovering things that heretofore been completely unknown to us. Chi Lin Nunnery definitely falls into the latter category! 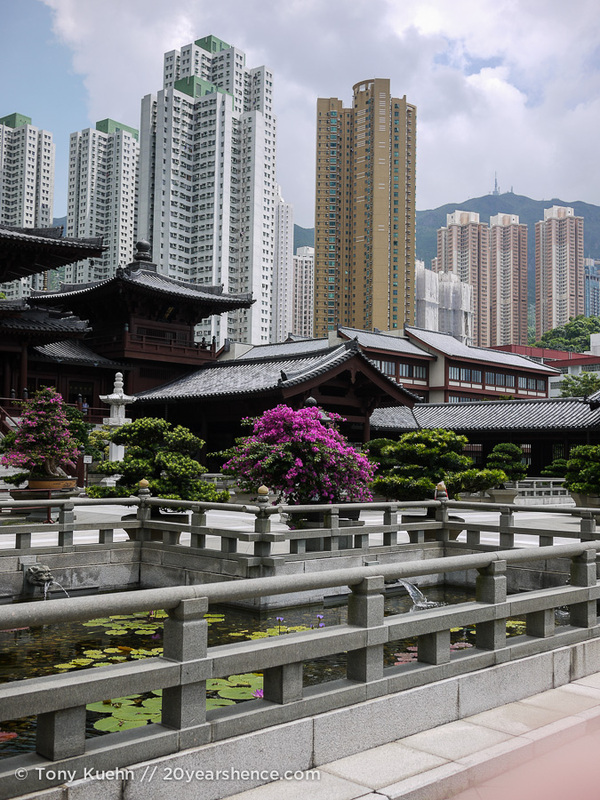 When we had envisioned our trip to Hong Kong, our priorities had been pretty singularly focused on attractions of the gastronomic variety, with a healthy dose of bustling, somewhat gritty urban cityscapes thrown in for good measure. While Hong Kong certainly delivered on both those fronts, not ever in my wildest imaginings would I have presumed it to also include pockets of ethereal beauty. 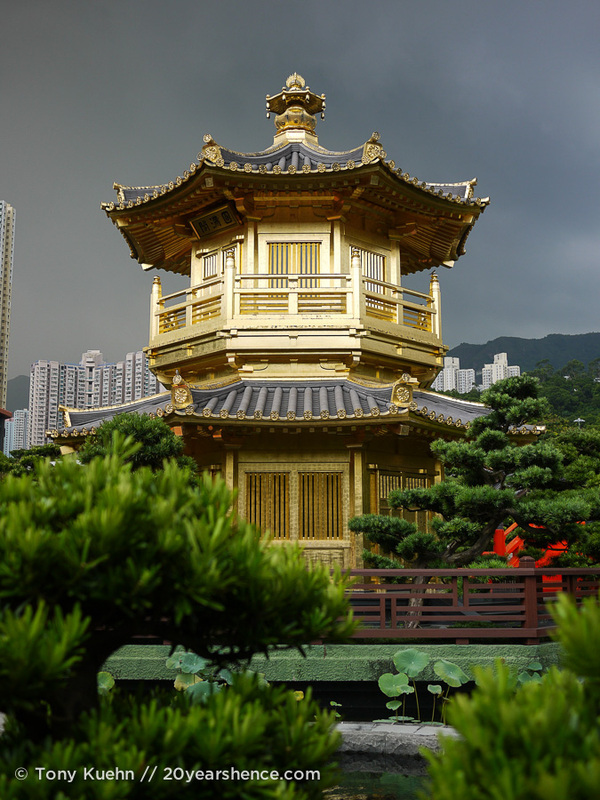 Were it not due to the recommendation of our friends & Hong Kong natives, Yetta & Alan, we never would have known that Chi Lin Nunnery and the adjacent Nan Lian Gardens ever existed. What a huge loss it would have been if we had missed out on visiting these two places; though they were completely incongruous with our limited & trite preconceived notions of what Hong Kong would offer us, we swiftly came to view them as the twin jewels of Hong Kong’s Diamond Hill neighborhood. 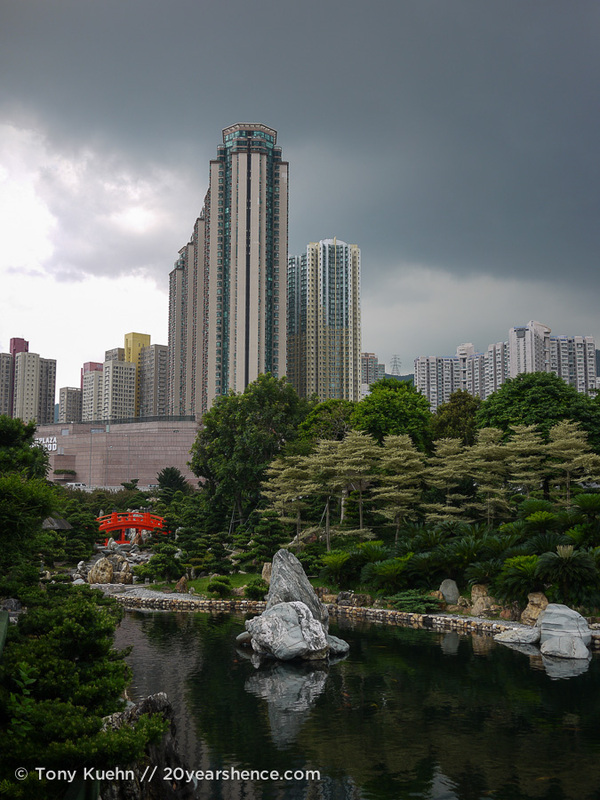 Exiting from the nearby MTR station, we little suspected what lay in store for us, as despite Yetta and Alan’s claims that incomparable beauty awaited us, the surrounding environment looked (and sounded) like any other district in this city-state hybrid we had visited thus far. 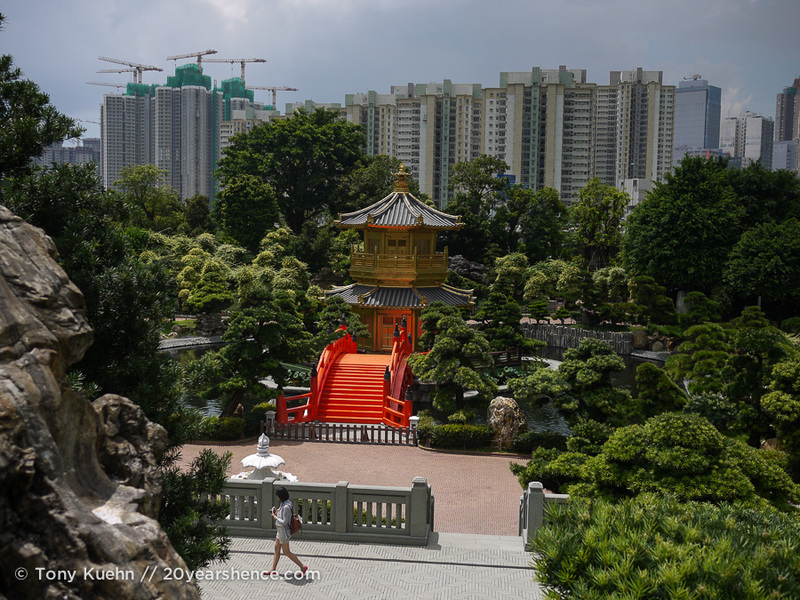 Yet within seconds of stepping inside the walls of Nan Lian Gardens, it was like Alice tumbling through the looking glass into an entirely new world. Safe within its hallowed walls, the discordant calmor of car horns died away, the lush greenery of the gardening damping out the sounds far better than any velevet curtain ever could. 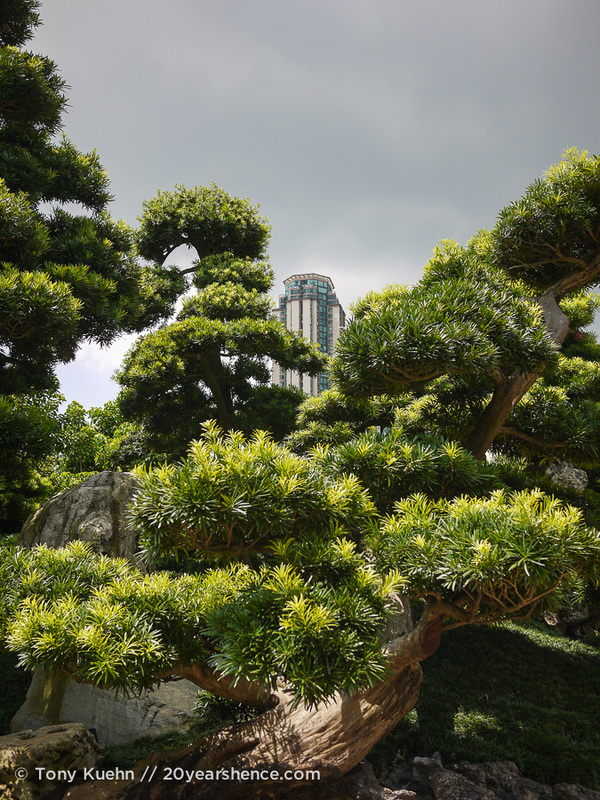 Like all good Asian gardens, Nan Lian is impeccably manicured, not a leaf or stone out of place. The shrubs and plants were all so green, the teahouses and bridges so utterly perfect and pristine, none of it seemed quite real. Around ever curve in the various winding paths that we wandered was one stunning view after the other, so that we had the sensation that we were continuously stumbling into an ancient Chinese painting somehhow brought to life. Looking at the photos, you might think that the gorgeous natural splendor of the park might have been lessened by the towering skyscrapers that circle it like urban thorns, and yet rather than detracting from the beauty of the place, the juxtaposition only served to enhance the beauty around us and heighten just how surreal our surroundings were. 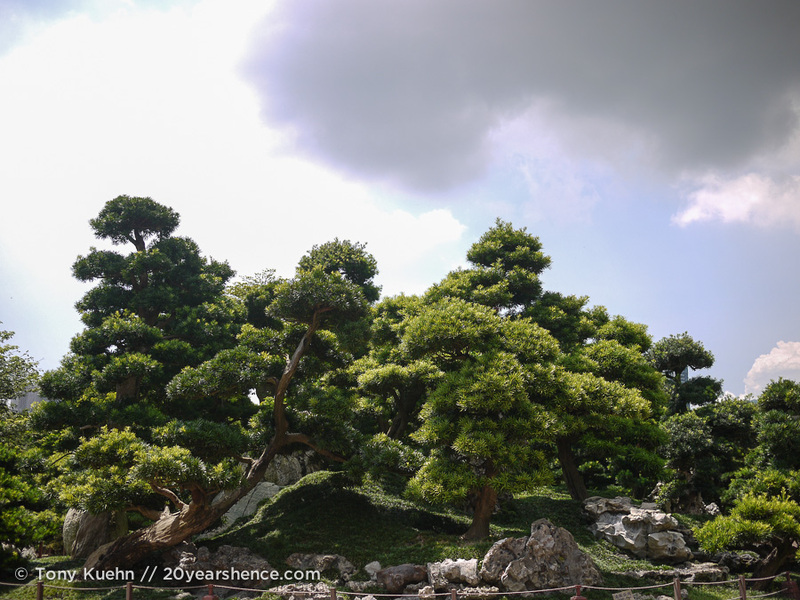 So spellbound by Nan Lian was I, that as the pale blue of the sky began to fade into increasingly darker shades of gray, I merely thought this new, slightly ominous backdrop served as a more dramatic canvas for the garden. And though I was already quite certain that this was by far the prettiest garden I had ever had the good fortune to see, when rain finally began to fall, I thought it the slick sheen it gave to the stones only made them more lovely and the golden pavilion at the garden’s center only shone all the brighter for it. 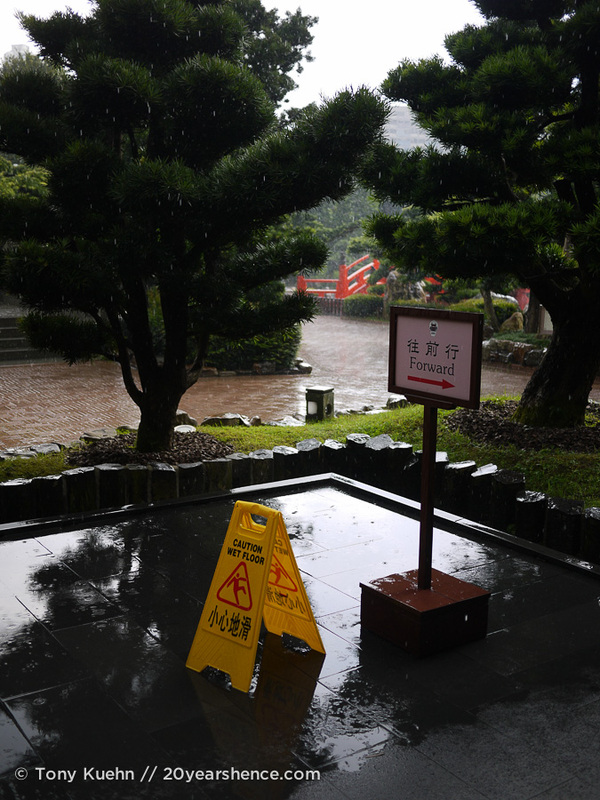 Although the garden is free to visit, when the rain became more insistent, we chose to pay a small fee to visit the small ceramic exhibit housed in one of the buildings. Though we had initially paid the entrance fee simply as a means of waiting out the weather (rain is only charming in small, gentle doses! ), we wound up being completely amazed by the exhibit. Unfortunately photography was not allowed, but the gallery featured ceramic vases and flat panels and screens that had been painted by a modern master who has actually pioneered new glaze techniques which have allowed him to achieve some truly impressive pieces of art. The brushwork featured on the pieces was astounding, and it was evident to both Tony’s skilled and my unskilled eyes that each work had been rendered through pure passion. Admission to the exhibit was only $20HKD (about $3USD), which is insane! Although the collection was not huge, the quality far surpassed that small pricetag. We wandered over to another building, this one housing multiple wooden scale replicas of various temples and buildings found in mainland China. First Takayama and it’s scale model of Nikko, now this! What is with Asian countries and their obsession with minaturizing things?!? After exhausting all of our indoor time-waster options, we decided to sit on the ground under an awning outside the replicas building. A friendly guard then informed us that sitting on the ground is generally viewed as an act of protest in Hong Kong and so is frowned upon. He let it slide as he knew we were not making a political statement (perhaps we are just anti-replicas?) and merely wished to wait out the rain, but another guard eventually came along and caused a large fuss and shooed us away. So when in Hong Kong, don’t sit on anything that isn’t a bench! 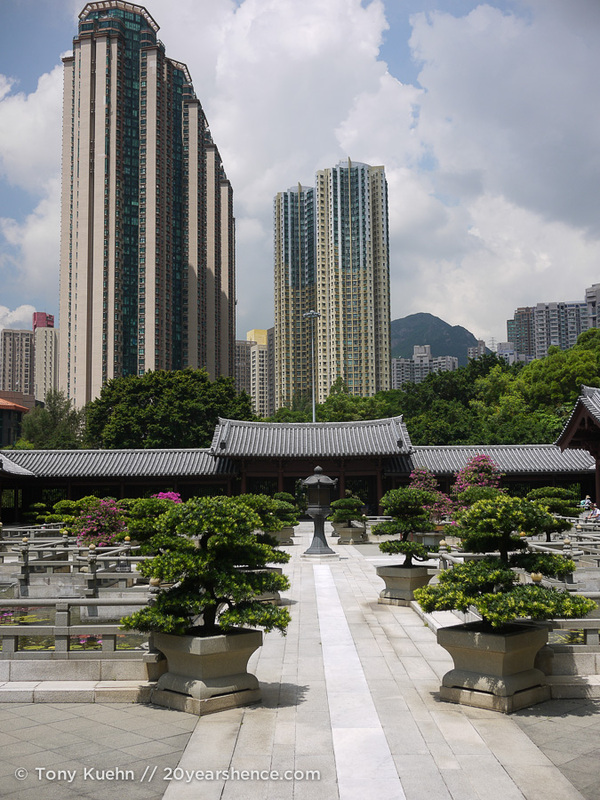 Scurrying across the street, we left Nan Lian Garden and entered Chi Lin Nunnery. I didn’t think it would be possible for anything to compete with Nan Lian, but Chi Lin was so exquisite it was almost painful. 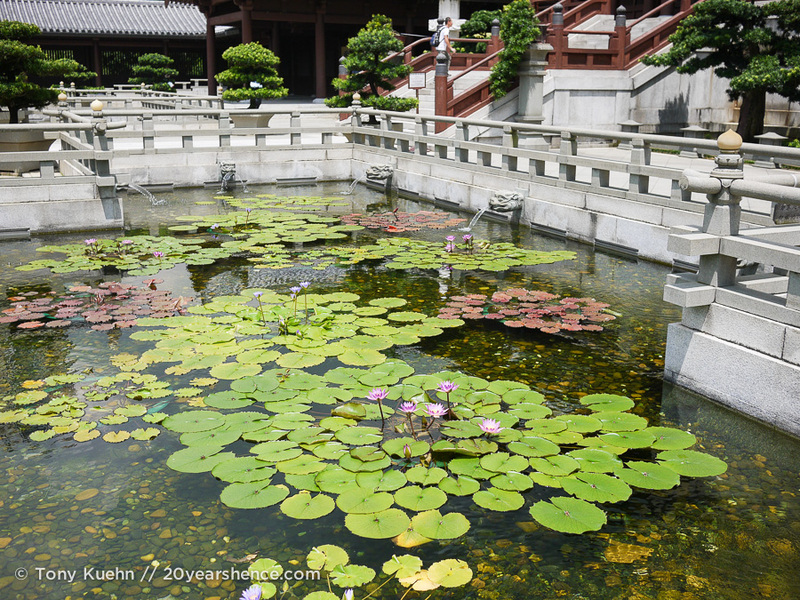 The central courtyard features several gorgeous lotus ponds, and the architecture and landscaping of the bright hydrangeas that pepper the area is so exact that it bypasses clinical and seems almost dreamlike instead. As we trailed through the building, we entered the sacred space where visitors come to worship and make offerings to local deities, melodic and hypnotic chanting driftiting through inconspicuosly placed speakers, encouring a sense of utter calm and peace. 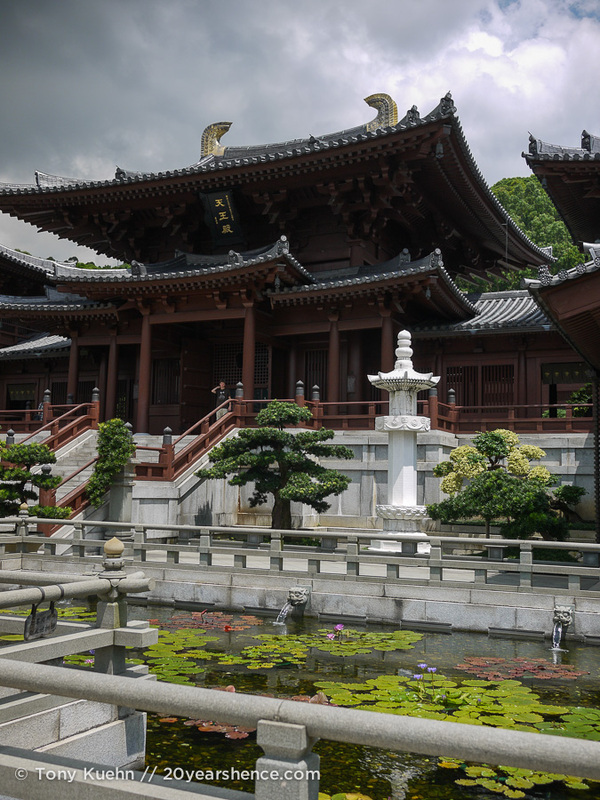 Due to the sacred nature of the space, no photography was allowed past the courtyard, but imagine shrines featuring riotous explosions of color and gilded extravagance, and you’ll be on the right track. 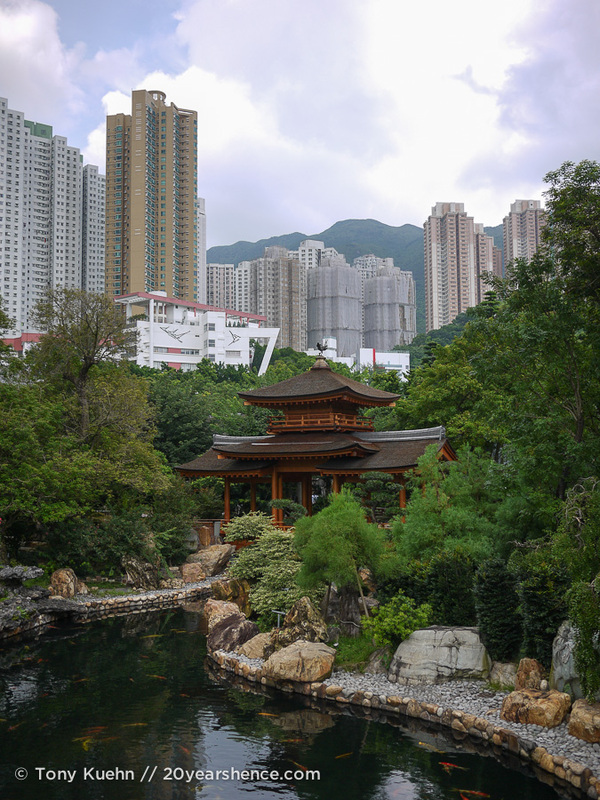 To cap off our time here, we returned to Nan Lian and had a late lunch at the vegetarian restaurant that looks out onto the garden and lies beneath a waterfall. 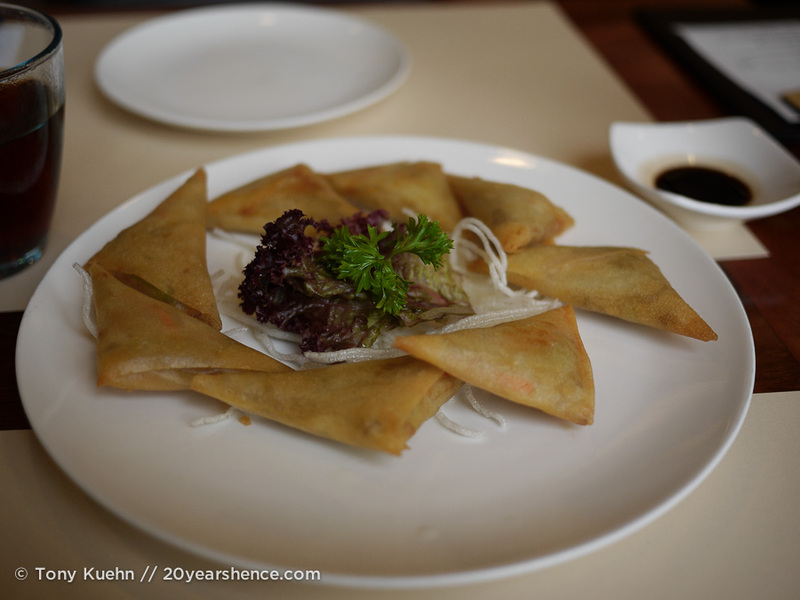 You might think that at a restaurant affiliated with a Buddhist nunnery the food might risk being simple and bland, but in keeping with all the expectations that had thus far been turned on their head that day, we wound up dining on a sumptuous feast. 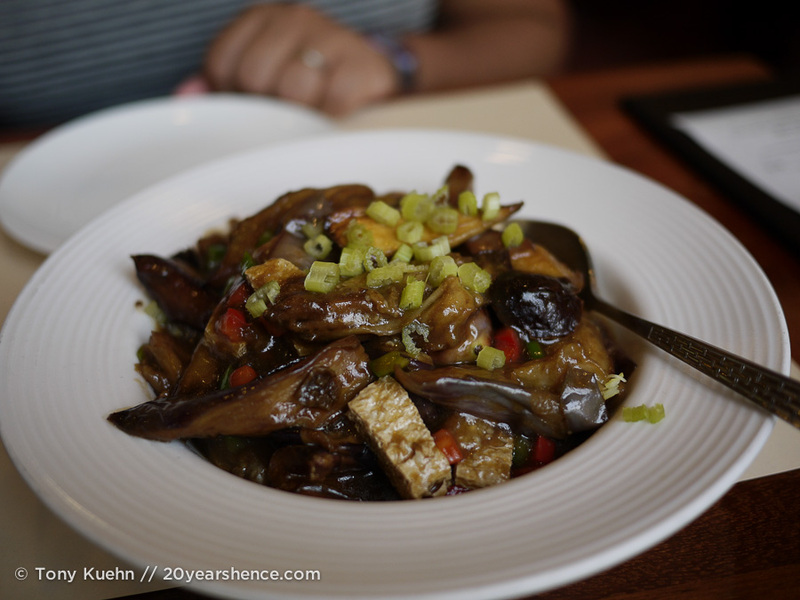 We began with curry puffs, which were truly like little dollops of cloud, followed by rich pieces of silky eggplant and chewy morsels of tofu skin that were slathered in a sweet & sour sauce. But truly, the pièce de la résistance of the meal had to be the noodles in a braised mushroom & creamy truffle sauce. The earthiness of the truffles paired with the rich cream was unreal! The ultimate umami explosion, this dish was utter decadence and incredibly filling. I felt I was bursting at the seams when we finally put our chopsticks down, but I still had to refrain from licking the plate. All the more incredible, this dish only cost us $12USD! A splurge to be sure in a city with plenty of cheap food options, but when we consider the generosity of the portion and the liberal use of truffles, we’re more than confident that we would have paid three times that price back home! 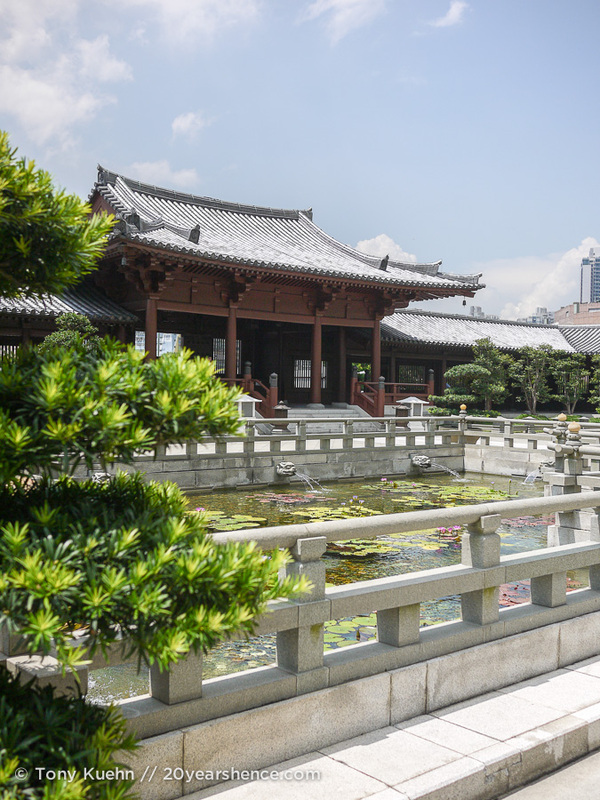 Chi Lin Nunnery & Nan Lian Garden are both paragons of Asian architectural and horticultural beauty, and truly offer an island of tranquility in the surrounding sea of madness that is Hong Kong. They are places that encourage their visitors to take the time pause and reflect, and enjoy the peace and happiness that come in taking the time to gaze on and contemplate beauty, and to be still. From first sight, I loved Hong Kong fiercely, for its energy, its metropolitan splendor, its gritty beauty. Chi Lin Nunnery & Nan Lian Garden are the complete antithesis of all that, and yet my response to them was so visceral it verged on spiritual. I am certain that of all the slices of my heart that I left in this city, the largest piece lives somewhere on their grounds. 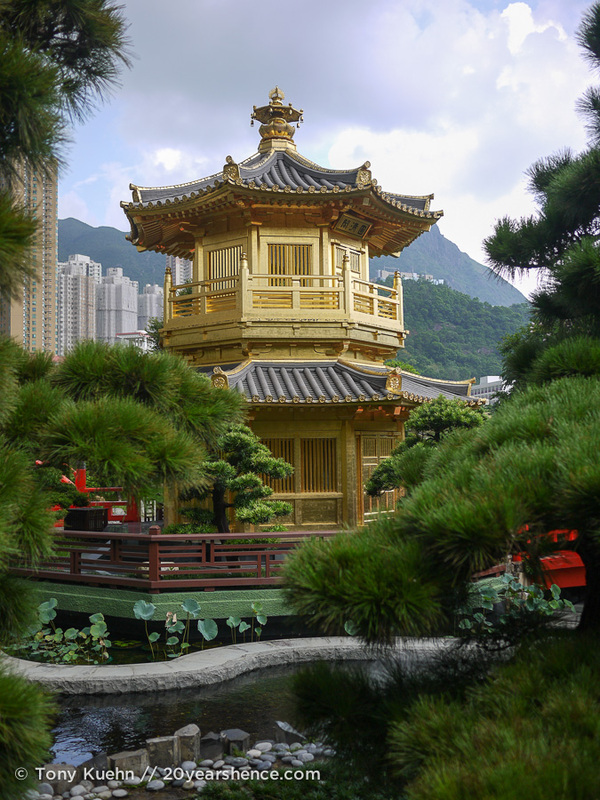 If you’re ever in Hong Kong and looking for the extraordinary, or even just a place to escape the crowds and the noise, I think you’ll find it here. Awesome! I’m hoping to head to Hong Kong next year and your photos have definitely added this to my list. Glad to see you’re embracing the impulsiveness of travel rather than the set plans. Yes, we really have come to embrace the unknown when it comes to travel… once you start, it makes you wonder why you spent so much time fretting over plans in the first place! The stuff we discover and don’t plan for generally winds up being our favorite stuff in the end! By the time we get on the road, we will have been planning and saving for years, too. I don’t think I’ll be too sad to leave it behind, at least not some of the boring research. But I do worry about balancing my planning with a more casual attitude toward travel. If I can do it, anyone can! Seriously! When it came to just winging it and “seeing what happens”, I can’t tell you the paroxysms of anxiety that would cause in me, but now, more often than not, we take each day as it comes, and rarely have more than a rough outline for the next two weeks. We show up in places without anything booked, and honestly, the freedom it has provided has been great. Plus, without a hard set of plans, I find I am less likely to be disappointed (by myself or the city when it inevitably fails to meet my expectation)! It might not come naturally to you, but time traveling like this does change you. 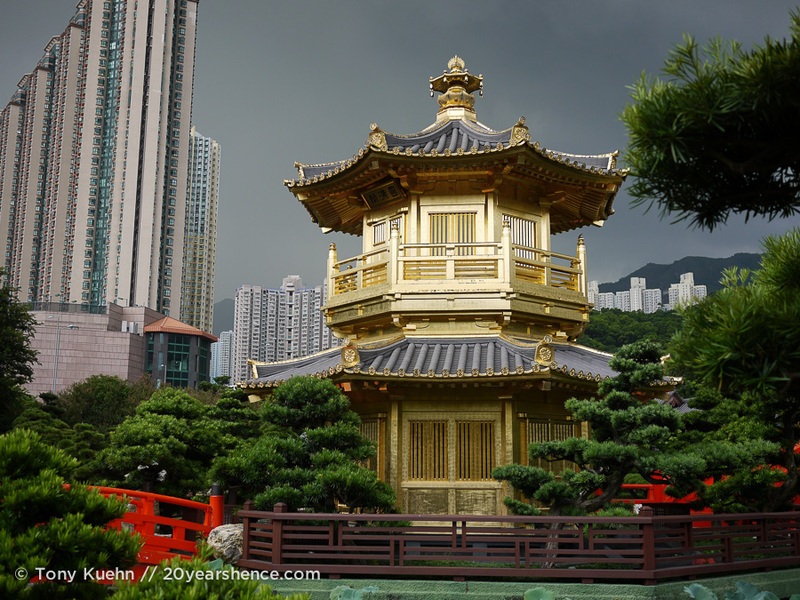 I missed out on that garden when I was in Hong Kong 🙁 Looks beautiful! I also remember being unable to sit on the floor in Hong Kong – I was exhausted after loads of travelling and waiting for a train. I sat on the platform and was told to stand up. I didn’t know it was a form of protest – thanks for filling me in! Seriously, if they don’t want people sitting on the floor, there is an easy solution: have more benches! It is so weird to me that places like this have such strict rules about things like this but don’t offer up viable alternatives! 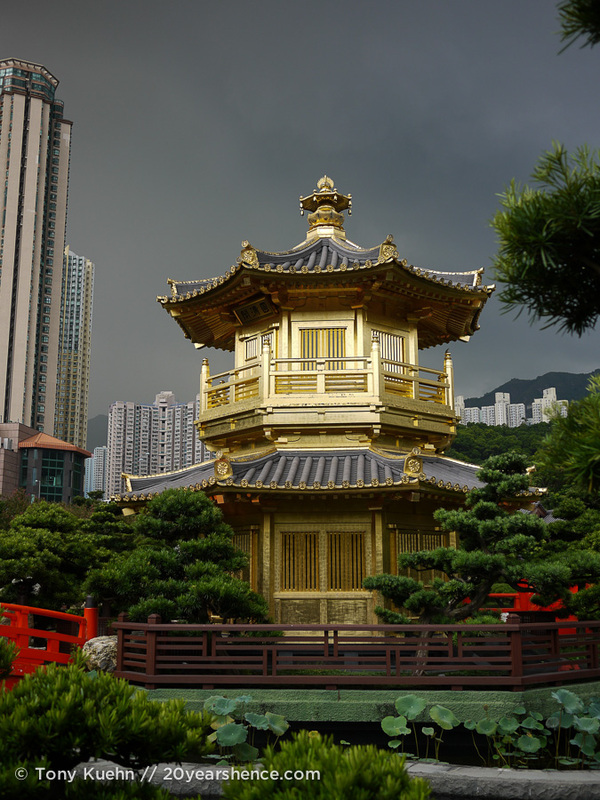 It was similar to the Golden Pavilion, I suppose, yet somehow felt even more dramatic and ostentatious! 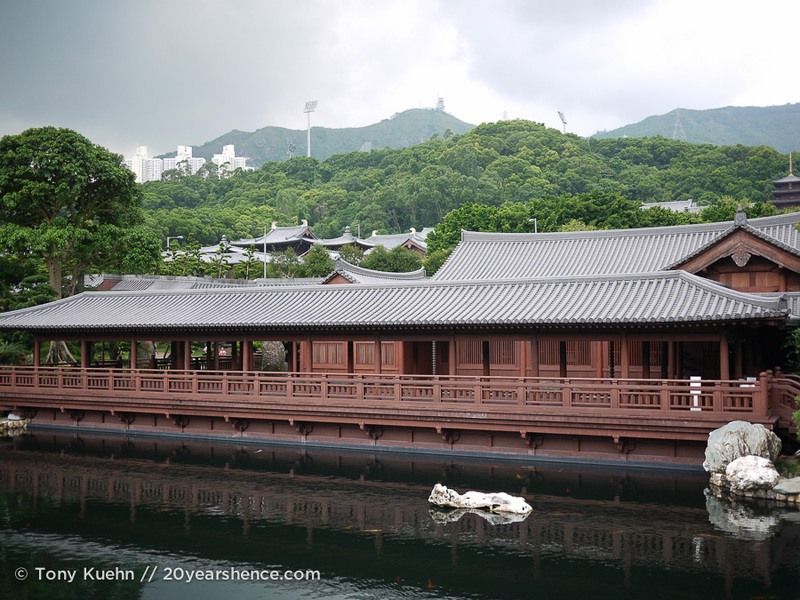 If you ever do visit HK, you must see this for yourself! Awesome pictures! We just found your blog via Kim’s SoManyPlaces blog. How fun and exciting for you guys! We are a couple from Fayetteville, AR, not too far from your hometown in Tennessee! This year we also quit our normal lives and set of to travel around the United States with our travel trailer! It’s always really fun to discover other blogs of folks following their dreams as well! Looking forward to reading your blog!! Thanks for stopping by, Maria, and I’m glad to hear you are enjoying the blog! I have to admit, during my tenure in TN, I never traveled to nearby AR, however on of our really good friends is from there so it almost feels as though we know the state nearly as well as our own! Happy to have you along for the adventure, and look forward to reading about yours as well! The more I travel, the less I plan. I think you nailed it when you said that preplanning didn’t take into account how you feel at the moment. At least I’d like to look at it that way instead of admitting to being lazy! Now, let’s talk about that meal. First of all, I’m currently starving and in a country that is insanely expensive for food. So I kind of hate you right now. Second, I know what I’m ordering if I ever find myself in Hong Kong. And thirdly, Hong Kong just moved a few slots higher on the “To Visit” list. I have horror stories about prices in Oz, so I accept the full brunt of your jealousy! Food was not only insanely delicious in HK, but it was also really cheap, which is kind of deadly combination. Though I’m not vegetarian, I can fully appreciate meals without meat products, and this meal at the nunnery is one of the best I’ve ever had. 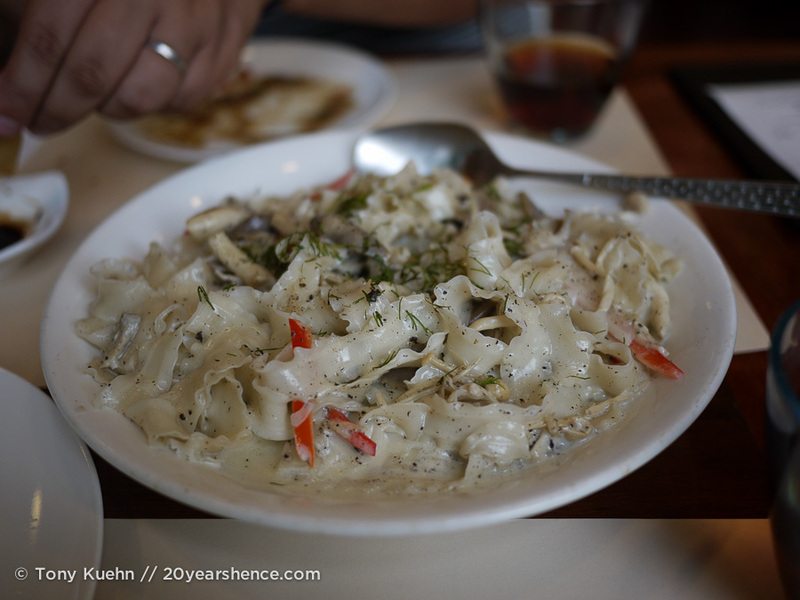 I still dream about that truffle pasta… you should put HK on your list just for that!